In its previous life before being moved to Te Anau, our Lodge served as the Sister’s of Mercy Convent in the mining town of Nightcaps, some 100 km away from its present day site. 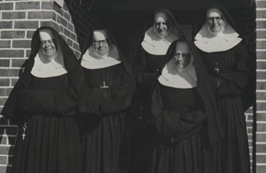 The Sisters of Mercy were originally founded by Catherine McAuley in Dublin, Ireland in 1831 and were the first religious sisters to come to New Zealand, arriving in Auckland from Ireland in 1850. 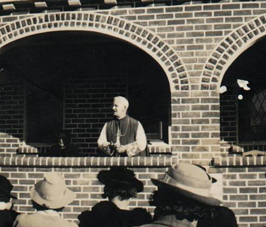 From 1850 to 1897 four Mercy Congregations were founded in New Zealand, with a small group of Sisters of Mercy becoming established in nearby Gore in 1890. Later, in 1897 another group travelled from Singleton, New South Wales, Australia, to live in South Dunedin & the Gore Sisters amalgamated with them. Before long, many young women joined them and groups moved to various parts of Otago and Southland, opening schools and teaching in them. A house was purchased in Wreys Bush for a group of Sisters in 1899 and a school was opened. This continued to flourish for a number of years. By 1917 Nightcaps was developing into a prosperous Southland township. The coal-mining industry was booming and work in the mine brought numbers of young families to the district, many of whom settled permanently. Parents were interested in the Catholic education of their children – the nearest Catholic school was at Wrey’s Bush, a distance of several miles from Nightcaps and with no transport service to the “Bush” the distance was too great for young children to walk from Nightcaps. The Parish Priest, Rev. J Lynch, was particularly interested in the spiritual well-being of the children of his flock and little time elapsed before he had provided a school in the centre of the town. 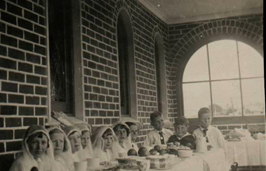 The Convent of Mercy South Dunedin supplied two Sisters to staff the school. These travelled daily to and from Nightcaps, forming part of the Wrey’s Bush community. They travelled by carriage which had been a gift to Bishop Verdon from the people of his Diocese but was not quite an up-to-date type – it was drawn by two horses and was quite an imposing sight on the Wrey’s Bush roads. With the passing of the years times changed for Wrey’s Bush community and many of its families moved away, resulting in a dramatic reduction of the school role by the early 1930s. It was eventually decided to close the school in Wrey’s Bush and to build a Convent for the Sisters in Nightcaps. By time there was a bus service for the State school pupils passing through Wrey’s Bush to Nightcaps and it was arranged that the Catholic pupils should travel by it to attend the Convent School there. Tenders for the building of a Convent were called. The contract price for the building of the convent was £2420 15s and the section had cost £100. 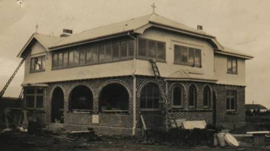 This photo was taken in June 1936 as the building of the convent neared completion. 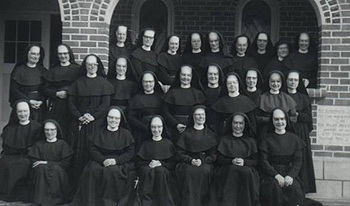 The new Convent was officially opened on 16 July 1936, and the Sisters of Mercy remained in Nightcaps until 1987 when the convent was closed. 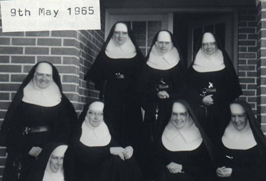 During the preceding fifty one years more than fifty Sisters lived there, working in the school, teaching music and speech and being involved in various aspects of the district’s life. 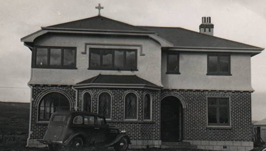 We are very thankful to Sister Julie Lawry of the Sisters of Mercy in Dunedin for kindly providing us with this information and old photographs of St Joseph’s Convent/Te Anau Lodge. For more information on the New Zealand Sisters of Mercy please follow this link.